A Math Game Monday for this week - just a little late, but it is worth it! This is a number game - it can be played at anytime. As a warm up, for early finishes, time filler and at any stage during the year. 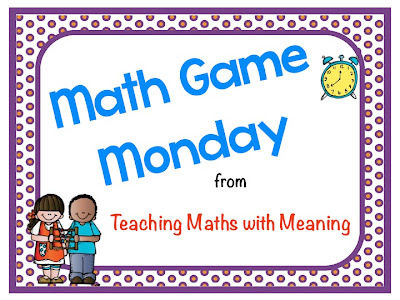 If you modify the game it can easily suit grades Kindergarten right through to 4th Grade! 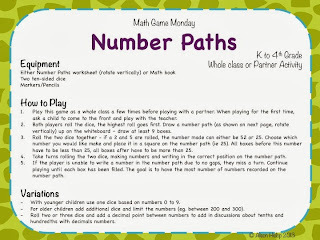 A worksheet is also included that you can cut into 4, however, children could easily draw their own number path on mini whiteboards or in their math books. Edit: Here is the video - the quality isn't great, but hopefully you get the idea! Thanks for this game. Is the game board always the same? And do the players just keep rolling until they fill all the boxes? Hi! Thanks for the comment - The game board can look like whatever sort of path you would like. I have just included some examples! Yes, the players do keep rolling until all the boxes are filled. This is a great game! Thanks for putting up the video to show how it is played.